To my Main Page "Mathematische Basteleien"
Tangram is one of the most popular games to lay. You put figures of 7 pieces together (five triangles, one square and one parallelogram). You must use all pieces. They must touch but not overlap. All seven tangram pieces consist of half squares with this shape: . There are 32 half squares or 16 squares altogether. ... ... You can build a 4x4-square with all the 16 squares. The main problem of the 'tangram research' is building a square with all the 7 pieces. You can also choose the smallest tangram piece, the blue triangle, as the basic triangle. I took the half triangle as the basic form, because the square built of all seven tangram pieces has the simple length 4. The difference is: You have to change the rational und irrational length of a side. ... ... You can invent new figures. A figure is good, if you recognize it by seeing. There are thousands of figures, which people have already built. ... ... [3sqrt(2)]x[3sqrt(2)]-squares are possible, if you leave blank one triangle or two. ... ... You can lay the trapezium in two different ways. The yellow and the green piece are a little bit bigger. You use the fact, that 4 and the triple of the square root of 2 (=4.24) are about the same. Other paradoxes comparing two similar tangram figures, which seem to be alike. About 100 students (aged 11/12/13) got the task to design birds by tangram pieces. Here is a small selection of nice birds. You can follow the positions of the sides of the half squares. If you have a mathematical point of view, you must allow only 1 and 2. Nearly all tangram figures belong to model 4. There are many nice and expressive forms, because there are less rules. They are organized by topics. 'A figure is convex', means: If you choose any two points inside the figure, the whole line between the points must also be inside the figure. Surprising: There are only 13 convex figures, you can build from tangram pieces. You find an interesting suggestion in book 3 and book 4 to classify tangram figures. This only refers to 'mathematical' figures', which bird 1 and bird 2 (see above) stand for. You can lay them into a coordinate system, so that the corners of the seven tangram pieces have integers as coordinates. In other words: You can order the tangram pieces in a way that the sides with the unit 1 are horizontal or vertical. The lines with the unit (root of 2) are diagonal. The figures are widened by little (white) triangles as necessary, so that a convex figure develops. These triangles have the same size as the blue tangram pieces. You count the triangles. Bird 1 needs 14 triangles and is 14-convex. Bird 2 is 5-convex. The convex figures don't need a triangle. They are 0-convex. You find all 133 (abstract) 1-convex tangram figures and solutions in book 4. There is the problem to find figures with the largest convex perimeter. 10 and 11 from Hannes Georg Kuchler. ... ... Daniel Gronau checked all possible grid tangrams by his computer. He found out that there are three more solutions. Bruno Curfs proved mathematically that 44-konvex is an upper limit (5). Probably the tangram pieces are developed from cutting a 4x4-square in pieces. You use it to make tangram pieces. You draw a 4x4-square with some diagonals on plywood or on cardboard. Then you saw or cut the pieces as shown at the drawing. 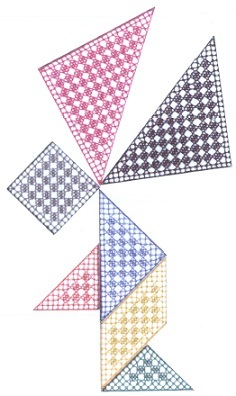 ALOIS STUDER MADE BOBBIN LACES OF THE SEVEN TANGRAM PIECES. Variants of the Tangram Game top You can make more tangram games, if you divide simple geometric figures like square, rectangle or circle. The most famous are (1) "Pythagoras", (2) "Kreuzbecher", (3) "Alle Neune", (4) "Circular Puzzle", (5) "The Broken Heart", and (6) "The Magic Egg". Here is a wide field for designing your own tangram pieces and playing with them. This page is also available in German.